A fellow blogger posted about this book recently and she gave such a glowing review that I knew I had to read it. 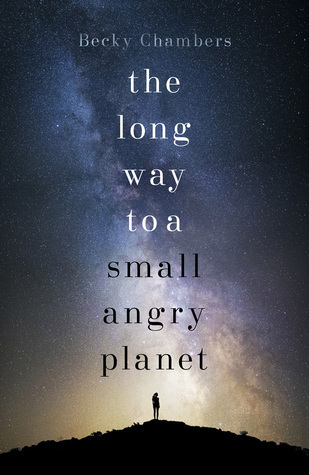 Giant TBR pile be damned, The Long Way to a Small, Angry Planet grabbed me from that first moment and wouldn’t let go. Synopsis: A multi-species crew from all over the universe live and work together on a worm-hole drilling ship. Rosemary, the newest member of the crew, is trying to escape her home world and is basically thrown into the deep end of interspecies protocol with this new job. When an amazing job opportunity presents itself, captain and crew must decide if they can handle a long trip that will test each of them in unexpected ways. When I learned that the author of this book managed to fund part of this book through a Kickstarter campaign I was intrigued. This could have gone either way, because as awesome as the Internet is, I’m often baffled by the results of crowdfunding. So colour me surprised when I began reading the book and immediately found myself needing to know more about each of the crew members. They are all such interesting characters with unique personalities and intricately detailed histories. I really loved that the many sentient species weren’t all just slightly altered versions of humans, but instead came with extra limbs, scales, fur, or tentacles. I’m convinced that this is a book that fans of Firefly would absolutely love. There are a few similar character personalities that show up in this book, and I often found myself thinking of those loveable space cowboys whenever Captain Ashby and his crew interacted with each other. The planets that they visit, and the people that they meet, all create a completely believable future where humans are considered just babies in the grand scheme of things in the sentient universe. I highly recommend reading this book, even if it’s just to try something new and exciting. You won’t be disappointed. Happy Read an E-book Day! I absolutely love Firefly – as soon as you made the connection, I knew I needed to read this. Great review! I’ve been wanting to read this one too, it’s interesting that it has been crowd-funded.